Drink Daddy® makes outdoor socializing with food and beverages easy and more enjoyable. Drink Daddy® keeps beverages within easy reach whether you’re standing, sitting in a chair or picnicking on the grass. It unfolds like an umbrella to form a taut tabletop with secure drink and stemware holders at the end of each arm. Because it’s lightweight, foldable and fits into its own carry bag, it’s easy to bring along anywhere you want to enjoy food and beverages. Able to hold several beverage containers simultaneously: wine and martini glasses, wine bottles, pint glasses, soda and beer cans, water bottles, disposable cups, cocktail shakers and more. Height adjustable from 21” to 35 ½”, Drink Daddy® moves to just the right height. Folds compactly and fits into its own carry bag. Drink Daddy® was designed to slip out of its bag and into the ground in seconds. Opening the tabletop is as intuitive as using an umbrella. The stake design enables easy set-up without requiring a lot of physical strength. See User Guide for detailed instructions. Drink Daddy® securely holds almost any kind of beverage container, including stemware. The easy-to-use stake keeps Drink Daddy® standing firm in almost any terrain, whether it’s level or not. Our optional patio base accessory makes it possible to use Drink Daddy® on patios, decks, parking lots or other hard surfaces. Like our stake, the patio base can be securely fitted in seconds. Many people prefer to use Drink Daddy® with the patio base all of the time. Drink Daddy® is meant to be enjoyed for years to come. Engineered for smooth and reliable operation, Drink Daddy® components include a durable alloy frame; tough nylon and polycarbonate molded parts; and an aluminum stake. The ergonomic levers are easy to grasp and the acrylic fabric is easy to clean. The stemware holders are optimized for easy entry, yet hold stemware securely, even when the table is bumped. Fully loaded, Drink Daddy® holds up to 25 pounds. 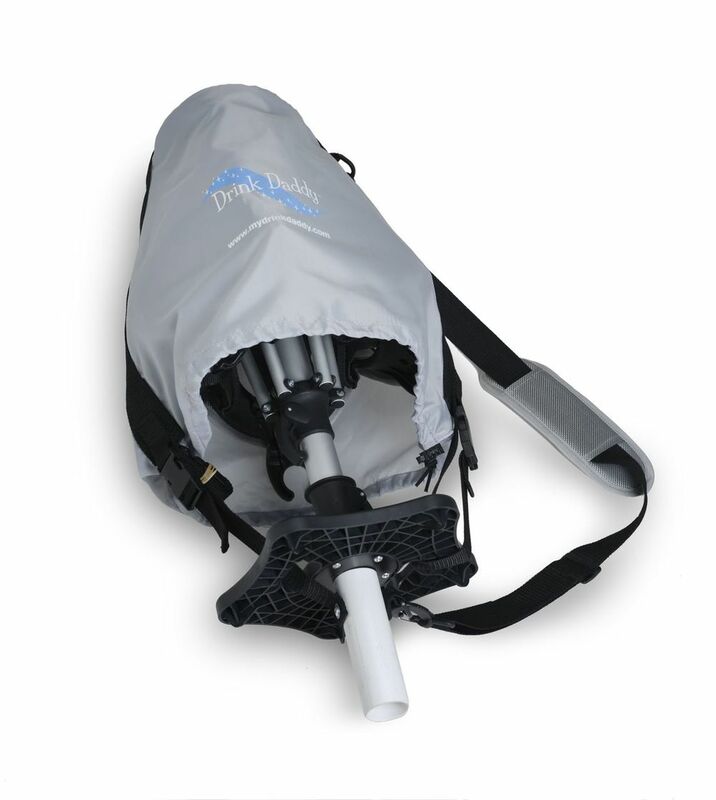 Because Drink Daddy® folds down to a compact size (26” x 13”), it’s easy to store and transport without taking up much space. You can also leave Drink Daddy® on the patio base accessory. Just fold down and fit with the carry bag to keep Drink Daddy® clean and better protected when not in use. Drink Daddy® is designed with durable plastic cup holders. That means hot beverages won’t melt or distort the material. It’s not only great for cold drinks in temperate climates, but also for hot drinks in cold weather –– including snow.